Effective and profound. Ancient, gentle, Japanese energy healing technique. In this treatment you wear your own loose comfortable clothing. Reiki is known as the laying on of hands, and has sister treatments in many cultures. It is non-invasive and totally safe. Reiki energy flows to wherever it is most needed. This can be on any level were you may be experiencing discomfort, or be out of balance. Reiki is a high intelligence energy and is drawn by you, the client not sent by the practitioner. This means healing can occur anywhere in the system. As a Reiki master I can facilitate your journey using ancient sacred symbols. These are steeped in layers of meaning and assist the efficacy of the treatment. Common experiences range from totally mundane to completely mystical! Here are some examples of my clients experiences: Hot and cold sensations, giggling, weightlessness, vibrant colors, regression, emotional release, consistent yawning, visits from spirit, freedom from pain, forgiveness, insight and understanding, absolutely nothing! The list could go on! With Reiki healing energy there are no guarantees. Even those who do not perceive healing on any level are still receiving healing. Due to the often life changing effects of Reiki it is recommended (though not obligatory) that, initially, a course of three treatments are booked not more than a week apart. This ensures a smooth transition. For this purpose I offer 10% discount when booking three sessions. The offer still stands if you wish to decide after your initial treatment. Long distance reiki healing can also be arranged. This means we do not need to be in the same place together. Many people have experienced profound results with this. It is especially useful for any situation where the reciever of the energy is unable to travel. 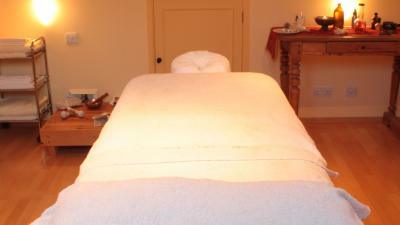 I find having a Reiki treatment with Angie deeply restorative. It helps to bring calm and healing to my mind and body. “I contacted Angela, after seeking reiki for a recurring tumour, I came along with an open mind having tried conventional Western Treatments without favourable outcomes. Angela works in an intuitive, holistic way, treating you with unconditional love and respect. From the first Session I truly experienced a profound impact upon me, the healing I have felt manifest within me has empowered myself to make considerable spiritual movements in my life.